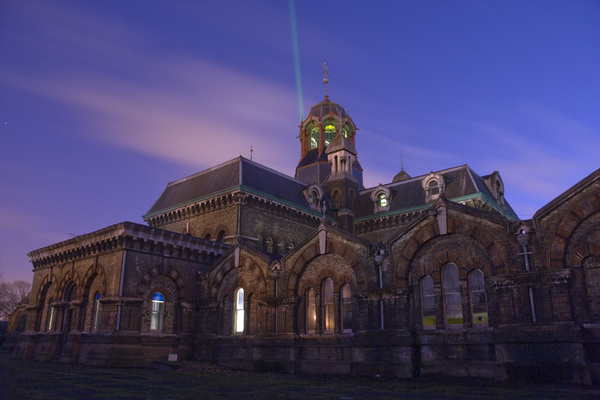 Abbey Mills pumping station 'A', built by engineer Joseph Bazalgette, Edmund Cooper and architect Charles Driver. Built between 1865 and 1868 it has been described as the cathedral of sewage. The Abbey Mills Pumping Station (Pumping Station A) is central to the sewerage system created across London in the mid-19th century. Built to lift sewage from the low-lying sewers, it collects a huge amount of the capital’s wastewater, transferring it to our northern outfall sewer and on to Beckton STW. Italian Gothic style. Greek Cross plan. Yellow brick with red and blue brick and stone dressings. Slate mansard roof. Two storeys plus dormers. Entrance wing and the ends of the other arms five bays wide with round headed central entrance porch. Round headed windows with polychrome decoration. Larger central window to upper storey divided by elaborate cast ironwork. Heavy stone string course to ground and first floors. Modillioned eaves cornice. Elaborate timber door with foliated ironwork. Slightly pointed yellow and red brick arches to recessed sash windows. Central octagonal domed lantern with round arched gabled windows to each face, containing case iron tracery. Elaborate wrought iron cresting to dome. Flamboyant interior or enriched cast ironwork. Central octagonal lantern. Original beam engines have been removed. Elaborate carving of stonework outside and inside. Abbey Mills is an early example of the work of Charles Driver, who assisted Bazalgette and Cooper. Driver specialised in engineering-based work, particularly railways. His designs include stations on the south London line, and those at Box Hill and Tunbridge Wells West. He established a considerable practice and obtained overseas commissions, such as the Central Market in Santiago, Chile.